If you ever need to find photos that have been taken with unannounced and unreleased phones, sites like Picasa are great places to check out. While cruising through there last night, I stumbled across a whole batch of photos that were taken with the DROID RAZR over the last week by two separate Motorola employees along with another (pointed out by a reader) that was taken with the Galaxy Nexus from a Googler. It was just yesterday that we saw other photos taken with the G-Nex, but that story apparently wasn’t flagged at Google as being that important? So what can we gather from these? Not a whole lot other than the fact that the RAZR photos for the most part are 6MP, which is the standard “widescreen” resolution that Moto devices seem to default to these days. The Galaxy Nexus on the other hand was a 2048×1536 (3.2MP) shot, a standard camera resolution setting for Samsung cameras like in the Galaxy SII. This is really just further proof that these phones aren’t ghosts and are a lot closer to being launched than I think any of us were expecting. 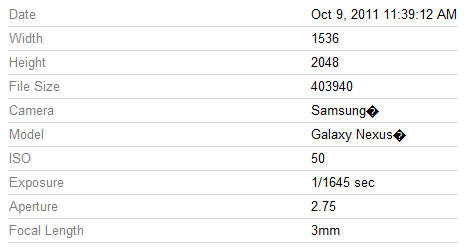 And the EXIF data on the Galaxy Nexus shot. Didn’t include the actual photo since it appears to be a picture of the dude and felt like that was slightly weird. *Note – Most of the other pictures looked to be fairly personal, so I went ahead and left off source links to give these folks some privacy. I’m sure you could all find them if you truly wanted to though.